Dozens of pool halls could be found in the Bronx in the 1950s, regular hangouts for mostly-male patrons residing in New York's smallest borough. Dion DiMucci often ran into Ernie Maresca attempting to sink one in the corner pocket and their casual friendship turned out to be beneficial to both, professionally speaking. Ernie was singing with a struggling doo wop group, The Monterays (one of several in the U.S. to use that name and particular spelling over a period of several years), when he met Ken Hecht and the two wrote "No One Knows," a woebegone ballad they offered to Dion and the Belmonts at about the time their fast-paced, vocally intricate recording of "I Wonder Why," the very first single on Laurie Records, was climbing the charts. 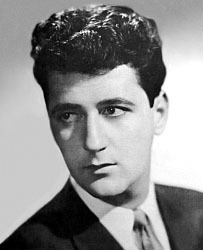 Maresca's songwriting career was off and running when his and Hecht's song became the second top 40 hit for Dion's group in the fall of 1958. On his own, Ernie composed "A Lover's Prayer," another sad sonnet Dion and the Belmonts placed on the charts in 1959. The Monterays, under a new name, The Desires, signed with startup label Seville in 1960 and had one single, "Story of Love" (a song penned by Ernie that failed, perhaps because the sound was too similar to the Belmonts). In 1961 the group, without Maresca, finally scored on the End label; as The Regents they hit big with "Barbara Ann," followed by "Runaround," a feverishly-paced doo wopper of Ernie's that hit the top 40 in August. Almost immediately, that one word reappeared in the title of a Maresca-DiMucci tune that went the distance; "Runaround Sue" landed Dion at number one in October '61 and the title has become a common slang term for "cheating ex." Maresca's "The Wanderer" hit in early '62, right before another Ernie-Dion effort, "Lovers Who Wander." It was a hard-hitting trio of hits for Dion...and guess who people were suddenly calling the hottest songwriter in the business? Unsure about his own vocal ability and satisfied thus far with his success writing songs, Maresca wasn't too concerned about chasing any kind of teen idol-like stardom. He'd recorded his share of demonstration discs at New York City's Associated and Allegro studios and had already done one single, "Lonesome Blues," for Seville in the summer of 1960; an atmospheric, jazz-influenced number, his crooning was more in sync with the previous decade. Its no-show status convinced him to stick to writing, but in early '62 he gave singing another try with "Shout! Shout! (Knock Yourself Out)," written with good friend Tom Bogdany. Dion's post-Belmonts group, The Del-Satins, punched up the production with insistent backing vocals: '...yell, yell, loud and swell...ya gotta scream, scream, you know what I mean...put another dime in the record machine!' It was nothing less than a fun party record, complete with a plug for the singer's recent songwriting triumph ('Hey, play another song like-a Runaround Sue...') and plugs for current dances (the twist, they fly and some '...foot stompin' baby just-a you and I' were recommended). The infectious call to '...liven up this crazy crowd' bounced into the top ten in March '62. "Mary Jane" retained the frantic pace and contained some hilarious lyrics ('Mary Jane, why do you siphon gas?...Mary Jane, you give me a pain in the brain! '...the lyrics to "Shout! Shout!" seemed deep and introspective in comparison). 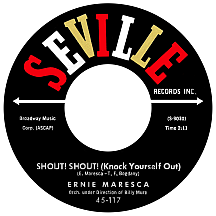 This and "Something to Shout About," the third lunatic tune in row as well as its follow-up, "Love Express" (these last two penned by Ernie with Pete Barron, a friend of Dion's and occasional Belmonts fill-in), would have given a different impression of the former ballad writer...if anyone, outside Ernie's family and friends, had heard them. DJs ignored these wild-but-well-produced singles while Ernie continued supplying hits for his pals (he and Bogdany wrote "Come on Little Angel" for the Belmonts). "Lonely World" by Dion was issued on Laurie after he left the label for Columbia Records, where one more girl-trouble Maresca-DiMucci ditty, "Donna the Prima Donna," added to Dion's ongoing accumulation of top ten smashes. Ernie continued writing for the Regents, who'd become The Run-A-Rounds (he and Baron penned "Unbelievable" for them, a summer '63 single on KC) before excising the hyphens and going by The Runarounds. 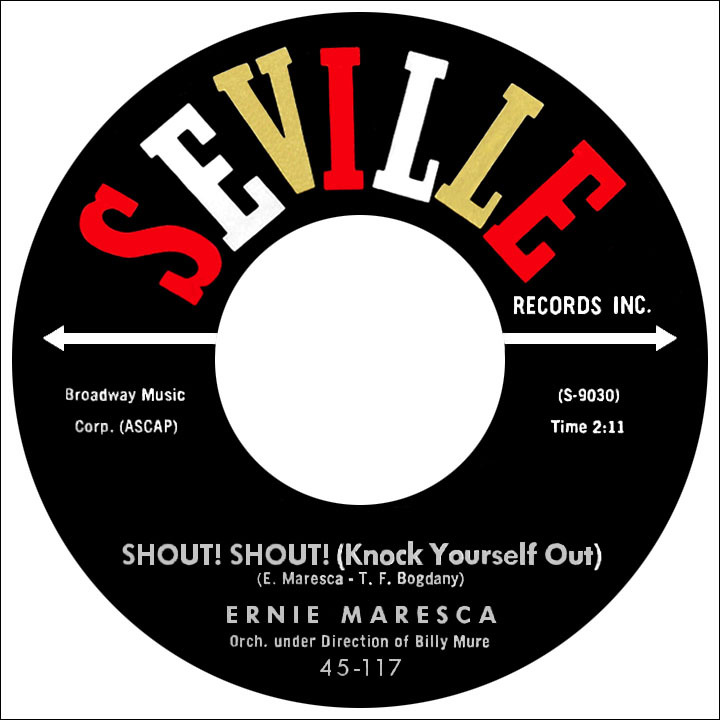 Later Seville singles by Maresca ("The Rovin' Kind," "It's Their World") lacked the energy of earlier releases but were at least more polished than "The Beetle Dance" (on Laurie's Rust subsidiary), a Beatles-related oddity from '64 that served as testament to Maresca's earlier self-assessment that he wasn't exactly a great singer. Composing radio-friendly songs was his forte for sure; "Hey Jean, Hey Dean" by Dean and Jean and "Party Girl" by Bernadette Carroll (both written with Lou Zerato, who'd broken into the biz by hanging out at the Laurie office) and "Whenever a Teenager Cries" by Reparata and the Delrons had respectable chart runs in 1964 and '65. He composed "Child of Clay" with Queens-born Jimmy Curtis, which became Jimmie Rodgers' final top 40 hit in 1967. Perhaps in an effort to shake off his "one-hit" status as a singer, Ernie kept pushing forward, recording occasional singles for Laurie including a weird 1968 remake of "The Wanderer" (with backmasking effects and irrational spoken comments) using the alias Artie Chicago (From the Bronx); The Belmonts supplied backing vocals on this doomed-to-failure novelty. Ernie Maresca backed away from the microphone at the end of the '60s and went to work in the music publishing department of Laurie Records, remaining with them until the company was sold to Capitol Records in the early 1990s.